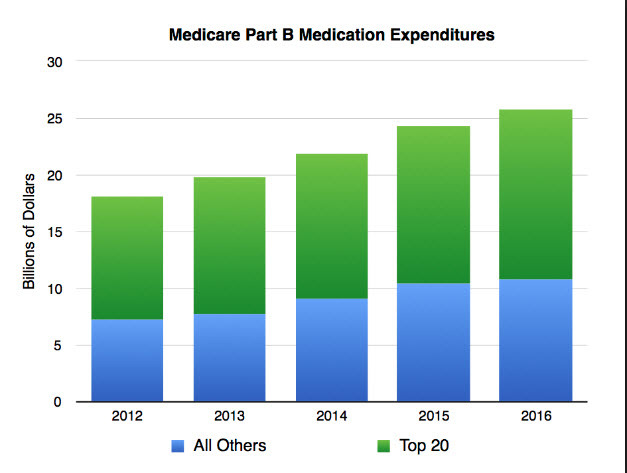 Medicare Part B Drug Prices Coming Down, Says HHS Secretary Azar. Medicare Part B Drug Prices Coming Down, Says HHS Azar. Medicare Part B drug pricing will be coming down, say HHS Secretary Alex Azar. This is due to the Trunp Administration’s proposal to tie prices for certain Medicare drugs to the prices wealthy countries pay overseas. Secretary Azar claims this plan to be implemented in the future has already changed the dynamic around pharmaceutical prices to the consumers benefit. Basically the plan calls for tying the price of physician-administered drugs under Medicare Part B to the average price that Germany or Japan pay. Right now, HHS claims that Medicare Part B pays on average 180% higher prices than those countries. European countries can negotiate for lower drug prices so that the drug companies can then gain access to their healthcare systems. And the drug companies benefit tremendously because European governments provide universal coverage primarily through public financing. Azar said that that the Trump Plan will ensure that drug companies can no longer charge higher prices in the U.S. to compensate for paying lower prices overseas. “No drug company CEO will ever agree to a discount in Europe without having to consider the effect of (the) price of reimbursement they will get in the U.S.”, said Secretary Azar. The Center for Medicare Services expects to issue a draft rule for the model this spring and start the model in 2020. Azar’s defense of the administration’s blueprint comes as he met with President Donald Trump last week over drug prices and after an analysis from Rx Savings Solutions that 60 companies would raise prices at the start of 2019. Indeed, this announcement by the Trump Administration comes shortly after the Senate Democrats announced that they will make lower drug prices a major policy priority in 2019. A group of House and Senate Democrats introduced three bills last week to bring down high drug prices. The bills include top Democratic reforms such as giving Medicare power to negotiate directly with drugmakers for lower prices and allowing Americans to buy cheaper drugs from Canada.